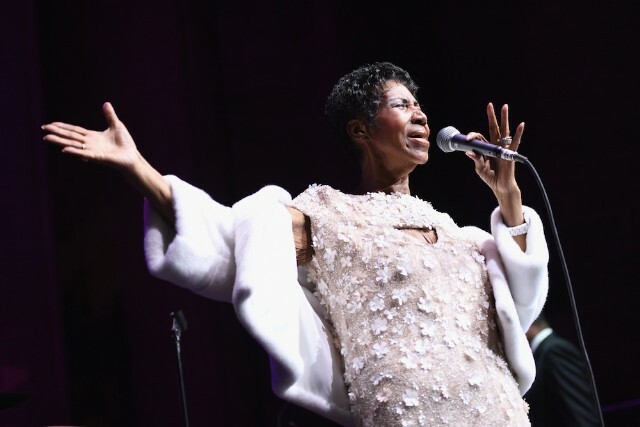 Jazz trumpeter and pontificator Wynton Marsalis has known Aretha Franklin since the ’80s. Upon meeting her, he writes in a new Billboard essay celebrating the Queen of Soul, Marsalis “called [her] ma’am so many times, she asked me if I was alright.” Much of the piece is devoted to recalling Franklin’s email correspondence with Marsalis, which was warm, supremely knowledgable, and ALL WRITTEN LIKE THIS!!!!!!! COLTRANE AND THE FELLAS USED TO ALL BE IN THIS SMOKE FILLED ROOM AFTER THEIR SET AND THIS YOUNG GIRL (ME) WOULD HAVE TO COME THRU THEIR DRESSING ROOM TO GET TO MINE. THEY WOULD BE LOUD ……….UNTIL I CAME IN. THEN…EVERYBODY GOT QUIET, NEVER SAID ANYTHING. ALWAYS GENTLEMAN! RIGHT THRU THE MIDDLE OF THEIR DRESSING ROOM. HAHA HAHA !!!!!! OH BACK IN THE DAY!!!! THERE’S A MILLION STORIES WYNTON ! The conversations weren’t strictly limited to jazz. Here she is on gospel legends Dorothy Love and Albertina Walker, who Franklin had mixed reviews for. DORTHY LOVE WAS CALLED DOT LOVE. SHE WAS COMPETITIVE WITH ALBERTINA WALKER FOR THE LEAD OF THE WORLD FAMOUS CARAVANS OUT OF CHICAGO. WHEN I WAS 13, ALBERTINA AND I TRAVELED WITH MY DAD TO SEE THE CARAVANS. DOT WAS OUT OF BIRMINGHAM, ALA. THEY WERE 2 PEOPLE IN GOSPEL WHO HAD LITTLE TO NO VOICE, BUT SO MUCH SPIRIT AND SAVOIR FAIRE, THEY COULD WRECK A HOUSE!!! For all her incredible ability, insider stories and imperial shade, she also had time for “COOKING OX TAIL SOUP TODAY FOR THE CHURCH.” Marsalis’s essay, and her emails, present a joyful look at the human woman behind the legend. You can read the whole thing here.